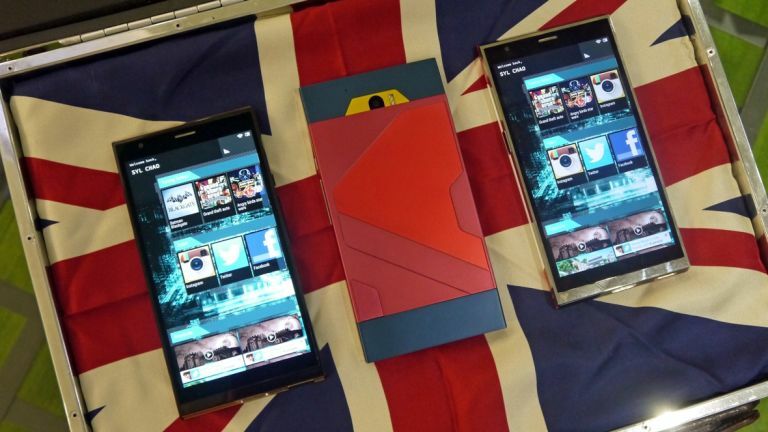 Hands on Turing Phone review: the ultimate smartphone for designers? The Turing Phone was announced earlier this year, but we've now had a chance to get hands on with the LA-based firm's first handset. Originally the smartphone was due to ship in August, but this has now been pushed back to December 2015. The folks at Turing are focussing the handset towards those with an eye for style, with designers the core market for the handset - although the company says it does have a wider appeal. One thing's for sure - the Turing Phone is big and heavy. It measures 151.80 x 77.10 x 9.05mm, ensuring it's a sizeable force in the hand. We found the overly angular design made it a little uncomfortable to hold, with some sharp edges digging into our palm. We were fondling pre-production samples, so things may be smoothed off when it finally hits the market - but don't expect any rounded corners here. At its heart is a Liquidmorphium frame, which Turing claims enhances the handset's shock absorption and reduces the chances of the screen smashing if you drop it. It certainly feels well built, with a solid construction providing a reassuring experience. Turing's not revealed the official weight of the phone, but we can assure you it is weighty - you'll need both hands to tackle this bad boy day to day. There's a choice of three intriguing colour options, with the black the least offensive of the unique trio. It could almost pass for Batman's phone. And that Destiny logo in the bottom left corner, what's that all about? No, there's no tie in with the popular computer game here. It's simply the Turing logo, which isn't identical to Destiny's, but is rather similar. On the left side you'll find a fingerprint scanner built into the edge of the device, although on the unit we got our hands on it wasn't functional. It does fall nicely under thumb/finger, so it should be easy to hit. The 5.5-inch display dominates the front of the Turing phone, and its full HD resolution provides a pleasing picture - although it's not as sharp as handsets rocking QHD screens. On screen things are very different. The Turing Phone is based on the Android platform, but it's sporting a totally re-imagined Turing UI interface. Apps are displayed in scrollable rows, with recent activity display in tiles below. It's a very different way to interact with your smartphone, and it will take some getting used to. Another negative point against the Turing Phone is the fact it's not Google certified, which means there's no Play Store for apps and none of the Google's services on the handset. That means applications are extremely limited for now, but Turing says it expects its own app store to grow in the coming months. We heard similar things from BlackBerry when it launched BB10, and now it's launched an Android phone - so we're not holding our breath here. The Android foundation is only a temporary solution however, with Turing working on its own operating system which will completely replace Google's offering on the handset. There will be a free upgrade to Turing OS once it has launched. At the heart of the Turing Phone is a 2.5GHz Snapdragon 801 processor, a chip which is now two years old. It's acceptable to see it land in a low cost device such as the OnePlus X, but considering the Turing Phone's flagship price tag it feels like we've been short changed a little. There is 3GB of RAM alongside the processor which means it's not going to fall flat on its face, and the limited interface (it's still heavily under development) did perform well during our time with the handset. In terms of internal storage you've got three sizes to choose from, 16GB, 64GB and 128GB, although with no microSD slot you'll probably want to avoid the smaller storage size. Turing has equipped its first smartphone with a 13MP camera on the rear, which isn't quite flagship levels of definition - but it's not far off. During our brief test the Turing Phone appeared to be a solid snapper, with a quick shutter speed and acceptable results from inside our office. For selfie fans there's also a front facing 8MP camera - which is nice. Locked inside the Turing Phone is a 3,000mAh battery, which will hopefully see the handset last a full day on a single charge - we don't expect it to go much further than that though. Slightly annoyingly Turing has opted for a "Wallaby" charging port on the base of its phone, which means your current microUSB cable won't be able to power up this handset. It's a similar offering to the MagSafe connection on MacBooks, and while a nice implementation it does mean you'll have to buy a few additional cables. In terms of the Turing Phone price, the 16GB model will set you back US$610 (around £400), the 64GB is US$740 (around £480) while the top of the line 128GB version comes in at $870 (around £560). The Turing Phone is definitely unique - it will stand out on a boardroom table or on your desk at work. That's exactly what Turing has gone for, but its distinctive design means it's likely to work itself into a niche, with many turned off by the size, weight, look and price. Then there's the operating system, which is so different to the likes of Android, iOS and even Windows Phone we fear it may struggle to win over the hearts of consumers.